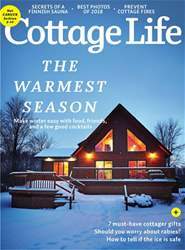 Water pipes tend to freeze more often in cottage country than in the city, and that’s why every four-season cottager should know a few pipe-thawing tricks. When you turn on a tap that should be working and nothing comes out, test other fixtures to infer where the frozen blockage could be. Finding out the location and extent of the freezing is the vital starting point, but there’s something even more important. When water freezes, it expands, often strongly enough to burst pipes. Always remember that a damaged pipe probably won’t leak water while it’s still frozen, but it could leak lots of water as it thaws. Always look for longitudinal splits as you’re defrosting pipes, and never leave your cottage with frozen pipes and the water still turned on.